.. much of this climate zone is sheltered by high country to the west, south and in some areas to the east, it is the sunniest region of New Zealand. Warm, dry and settled weather predominates during summer. Winter days often start with a frost, but are usually mild overall. Typical summer daytime maximum air temperatures range from 20°C to 26°C, but occasionally rise above 30°C. Late winter and early spring is normally the most unsettled time of the year. Typical winter daytime maximum air temperatures range from 10°C to 15°C. Annual hours of sunshine average at least 2300 hours. Northnortheast winds prevail in Nelson, while southwesterlies prevail about Blenheim. Nelson has less wind than many other urban centres and its temperatures are often moderated by sea breezes. Boasting New Zealand’s highest average sunshine hours – 2,500 annually – Nelson is the gateway to the magnificent Abel Tasman National Park and some superb bays that make it a tourist mecca. Full size version of chart here. 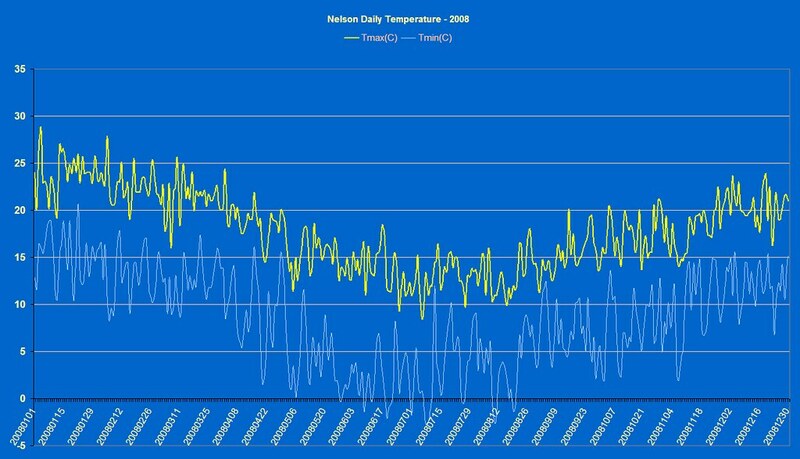 Above is min / max temperature chart for Nelson for calendar year 2008. It has been taken from the weather station at Nelson Airport, and as most Nelsonians will tell you as thats ground level nearly the temperatures are usually 1-2-3 degrees above that in many parts of Nelson, especially in the higher elevations. I can concur with that, I live about 80m above sea level in Stoke and in winter when there are frosts down on the flat, at the airport, we don’t have one at home. Wikipedia also has an excellent section on Nelson weather, click here. Nelson still holds the South Island and whole country New Zealand national records for the highest amount of sunshine…..
in one month @ 336 hrs, and the highest amount in one year @ 2711 hours. The above chart shows the suns traverse at the top obviously in winter, the green line being the 21st June and the lower blue line for the 21st December. To understand both above charts go here. 2009 – we won again! Go here for the 2009 details. Although 2008 didn’t quite work out how we would have liked. Pipped at the post as we say. A cloudy December meant Nelson was pipped at the post in the annual battle for the top of the south sunshine hours crown, Nelson weather forecaster John Mathieson says. 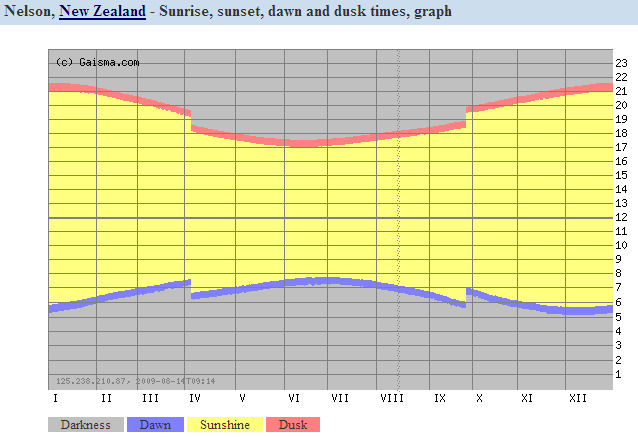 Figures to the end of 2008 show that Blenheim received 2505 hours of sunshine, compared with Nelson’s 2471.9 hours. Mr Mathieson said that in the leadup to December, Nelson was ahead of Marlborough, but during the last month of the year Nelson recorded only 219.5 hours of rays — 22.5 hours fewer than average. Marlborough may be celebrating its second win over Nelson in a row, but Nelson took the crown for five years running before 2007, and in 2008 its overall sunshine hours were actually up 0.8 percent on the average. It was believed that either Whakatane or Alexandra were set to take the national sunshine crown, but this had yet to be confirmed, Mr Mathieson said. Nelson’s cloudy December may have frustrated holidaymakers, but farmers had 121mm of rain recharging aquifers during the month — a well-appreciated 42mm more than they would have normally expected. It capped a rainy year in the Nelson region, during which 1144mm fell a 21.6 per cent, or 204mm, increase on the average recording. This meant there was enough water in aquifers to easily carry the region into next month, Mr Mathieson said. The cloudy nights in December also helped to bump the average temperature up at night to 16.5 degrees celsius, a 0.2deg C increase. The region got off “extremely lightly” from the severe weather that hammered the rest of the country last night and today, with good weather forecast until at least Friday, Mr Mathieson said. Thu, 03 Jan 2008 07:32p.m. The long standing battle between Blenheim and Nelson over which has the most sunshine hours has a new winner. For the past six years, Nelson has boasted that it had the brightest sky, however it turns out that 2007 was Blenheim’s year. Blenheim recorded more than 2,565 hours of sun last year – about 50 hours more than rival Nelson. The National Institute of Atmospheric Research will release the official figures for the rest of the country in a few days, but according to initial figures from the MetService and HortResearch, 2007 was Blenheim’s time to shine. Although we may have briefly forgotten what the sun looks like, Nelson has been named New Zealand’s sunshine capital for the ninth consecutive year. The sun shone in Nelson for a total of 2580 hours in 2006, outshining perennial rival Blenheim, the second-sunniest place, by 52 hours. The National Institute of Water and Atmospheric Research’s 2006 climate summary, released on Thursday, shows Motueka in fourth place with a total of 2493 hours of sunshine, behind Tauranga, which clocked up 2507 hours. For more articles on the sun, sunshine in Nelson please click here. One thing you will notice if you are new to NZ and the region is the brightness in the quality of our light. 1 – 100km as the crow flies to the West from the the South Islands West Coast, and then the next land mass is Australia which is 2000km away over the Tasman Sea. 2 – 100km as the crow flies to the East to the South Islands Eastern coastline, and then the next major land mass is South America which is over 7000km away across the Southern Pacific Ocean. …and also courtesy of the prevailing winds. You could say the wind ensures the sun shines most of the time. Certainly there are no issues with pollution, urban or otherwise that would affect the quality of the sunlight like might occur in parts of Europe, Asia, and the Americas. There is a side effect with this though, and its not assisted by the Ozone hole. That side effect is UV Radiation. The graphic to the right shows Nelson data for 3rd Jan 2009, and as you can see we are already off the scale at 12. Although I do hope this site corrects its error when it says we only have 2400hrs of sunshine a yr [should be 2500hrs] they do have an excellent commentary on UV/Sunshine from an Immigrants perspective. 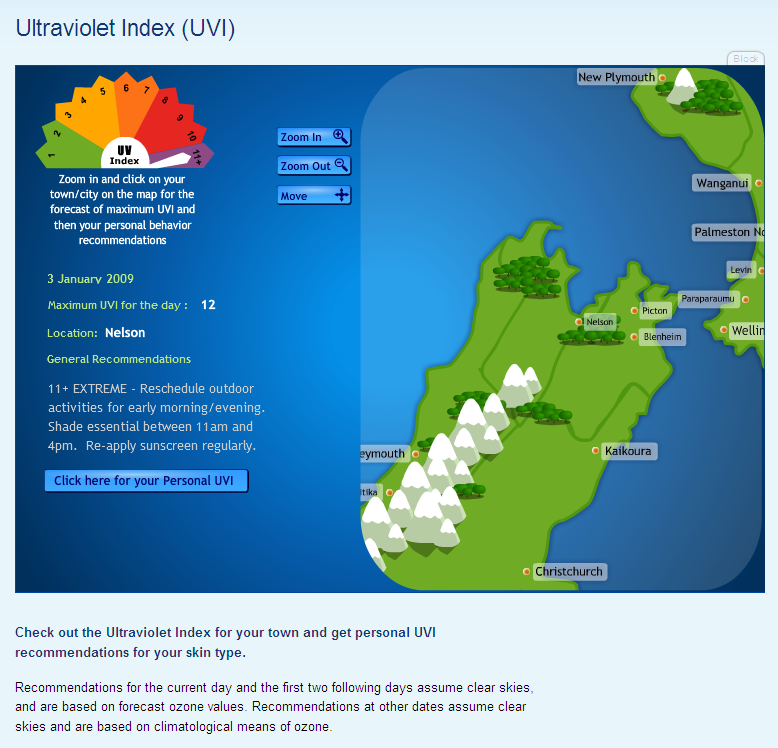 In NZ we have been taught to be aware of the UV Index? The UV index is a standard measurement of erythemal (sun-burn causing) UV intensity that gives a more objective measure than the old “time to burn” (which cannot account for skin tone). The scale is open-ended, but a UV index of greater than 10 is extreme and a UV index of less than 3 is low. For clear skies, the UVI depends mainly on the sun elevation angle and the ozone amount, view here. The UVI also depends on cloud cover, sun-earth separation, altitude, pollution, and surface reflections (e.g., snow cover). The highest values in the world occur in the tropics at high altitudes, where the UVI can exceed 25. The geographical and seasonal variation in peak UVI for New Zealand can be viewed here. In the NZ winter, the UVI rarely exceeds 3. 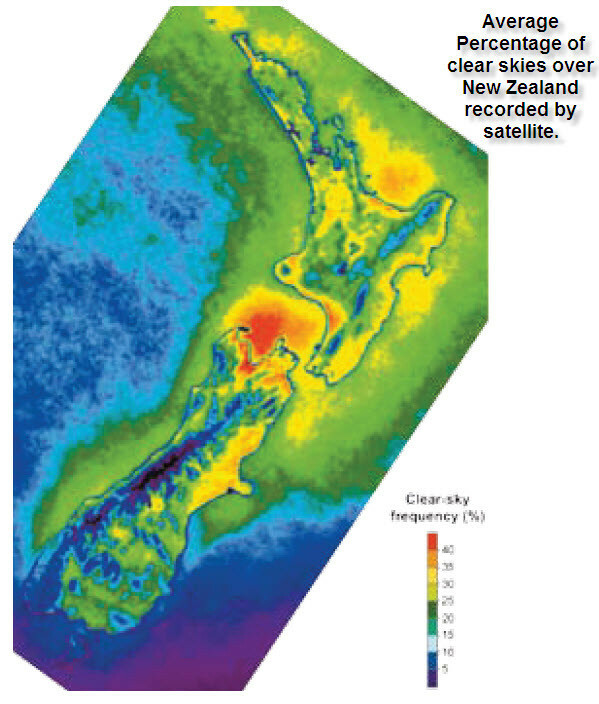 Because of differences in ozone, sun-earth separation and pollution, the peak UVI in NZ is approximately 40% greater than at comparable latitudes in the Northern Hemisphere. 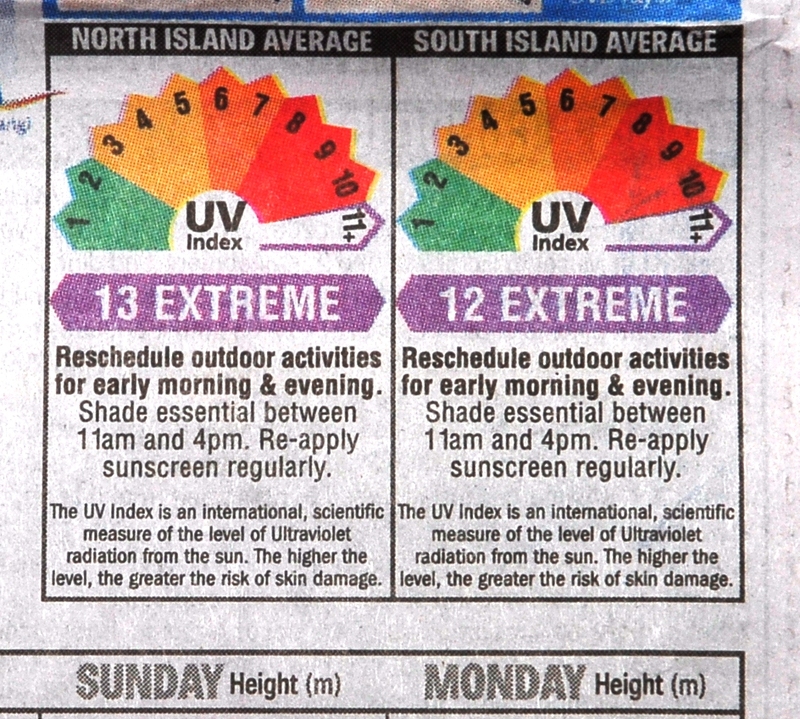 Most of New Zealand’s daily newspapers print a UV graphic similiar to the one shown above, and usually include in their weather section. This chart below basically demonstrates the differing UV Index levels on average months of the year, and its clear to see that Summer is definitely the time to show the most care. Also quite a comprehensive site here.